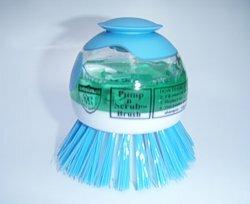 The Pump ‘N Scrub™ Brush is great for hard to clean spots, body baths, western saddles, legs, tails and manes. Easy to use! The brush top opens up, and you fill the reservoir with shampoo or saddle soap. Press the top of the brush’s handle as you wash your horse or clean the detailed engraving on your western saddle. The shampoo is dispensed out of the bottom of the brush and directly onto what every you are cleaning. No more wasting shampoo or saddle soap.